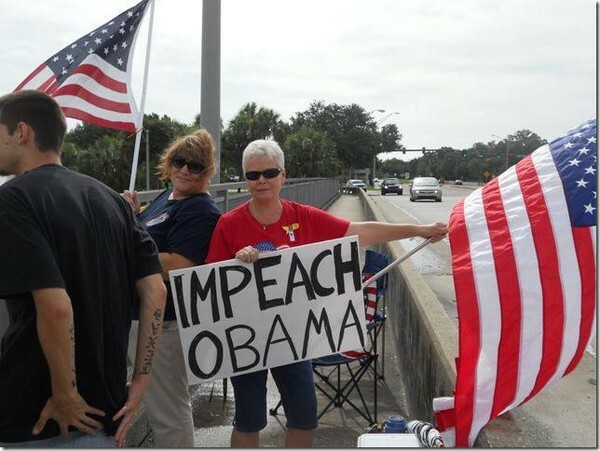 Impeach Obama Overpass Movement spreads across America! This is news you never heard/saw on the State Controlled Media. 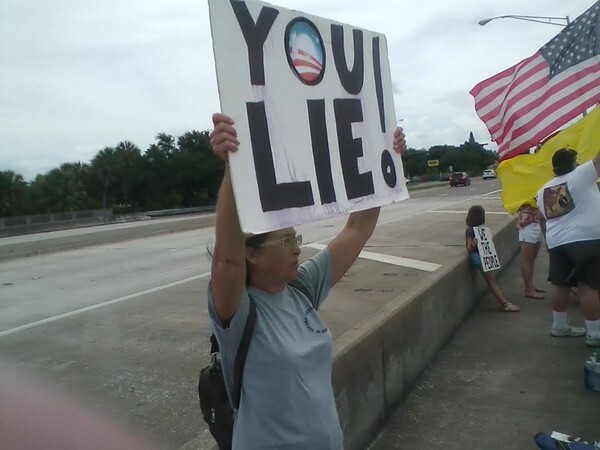 Do you remember that stupendous “Impeach Obama” demonstration on a California freeway overpass last June? On June 8, 2013, a group stood on an I-5 overpass in the seaside city of Carlsbad in North San Diego County, California, holding signs saying “Remember Benghazi,” “Obama Lies” and “No Amnesty.” Traffic slowed down for miles (but quickly picked up after the overpass), with many motorists honking their support. 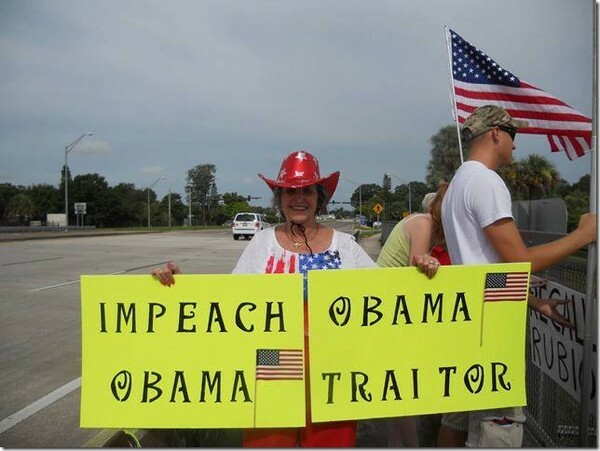 Despite the harassment from police, that first “Impeach Obama” overpass demonstration has started an entire movement that is spreading like wildfire across America! Inspired by the San Diego freeway overpass demonstration, a patriot in Oklahoma named James Neighbors started the “Overpasses for Obama’s Impeachment” movement. In just a few short weeks, Overpasses for Obama’s Impeachment has grown from the Founder, James Neighbors, to movement with groups preparing protests in all 50 states across America. Neighbors announced today that the protests are spreading across the country. The rapid growth of this new grassroots movement illustrates how strongly citizens across the country feel about the need to hold the president accountable for his actions in so many areas. Inspired by the protests in Carlsbad, Cal. Earlier this year on June 8, Neighbors created the page on Facebook, which now has a following of thousands with vastly more protesters in individual states organizing and preparing to take to the overpasses and streets across America in protest. Neighbors estimates that over 12,000 people across America have joined the movement since it began in mid-June and believe the protests will force Congress to act and begin the process of impeaching President Obama. On August 6th, the Overpasses for Obama’s Impeachment groups will stand together for synchronized protests across the nation in what the group has named “The Patriot Wave,” beginning in the Eastern Time zone, and culminating on the West coast. Neighbors emphasized that the protests will continue on a national level every week during the Patriot Wave, and at dates across the nation as determined by their state organizers. […] – Continued at Examiner. This entry was posted in Conservatives, Economy, Media, Obama, Obama scandals, Tea Party. Bookmark the permalink. We can all dream , can’t we ? I love your spirit but he will NEVER be impeached. I spent years protesting illegal immigration and nothing happened. The same will come of this demonstration either. Congress will just appease you and blow you off until 2016. But at least demonstrating makes you feel powerful for a few moments anyway. God Bless you for trying and good luck. This is excellent! The sleeping giant has awoke! While I believe the comrade Dear Ruler is guilty as home-brewed sin of numerous impeachable offenses, there is no way he is going to be impeached. The repubs don’t have the stones, and the dems, along with their MSM hacks, will start screaming RAAAAAAAAAAAAAAAAAAAAAAAAAAAAAAAAAAAACISM!!!!!!!!!!!!! – at which point the repubs would start running for the tall grass. The beat goes on. And on. And on. There had better be a game plan as the main course of this plan, you don’t want a repeat of Egypt or Libya up in here do you? Reinstate Glass Steagall, shut down the Banksters, open a new national bank and have Congress utter credit for job creation based on scientific research and development projects, agricultural, industrial and Space monitoring etc. We need to start with NAWAPA, check it out please. Thank you Dr. Eowyn for this great post! What a wonderful movement! Is this the Obamanation of Desolation John saw in Revelations? Is the mark of the beast your social security number? Will Persia/Iran attack Israel and blow up the earth? Stay tuned! The wine is free in heaven and I’m not going kicking to get there! Beam me up Lord! here’s the thing; Against all Odds BUT….I for one cannot go to my grave knowing that I didn’t do everything I possibly could do to keep our America free for my grandkids! So if that means that I call, email, protest, wave flags WHATEVER..I WILL do that! These damn Dems can out vote us yes but that doesn’t mean we tuck tail and run either. We had a Revolution to establish our LIBERTY. It’s up to all of us to preserve that! It is time for action, (whatever is necessary) to rid our country of ALL the criminals who are flushing us down the toilet. Obama and most of his administration are clearly CRIMINALS. No other word defines these scoundrels as well as CRIMINALS. They should be removed from office, by ANY MEANS NECESSARY!